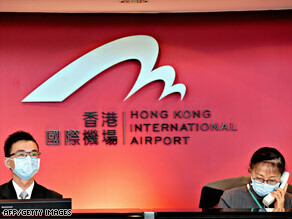 Airline employees in Hong Kong work Saturday, a day after officials there confirmed their first case of swine flu. Canadian officials on Saturday said they have quarantined pigs that tested positive for the virus -- scientifically known as 2009 H1N1 -- at an Alberta farm in what could be the first identified case of pigs infected during the recent outbreak. They said the pigs may have been infected by a Canadian farmer who recently returned from a trip to Mexico, the epicenter of the outbreak that has sickened nearly 660 people. Evans and other officials said it is not uncommon for flu viruses to jump from humans to animals, and that it does not pose a risk for consuming pork. The number of pigs infected was not disclosed. Roche, which produces the common anti-viral drug Tamiflu in a statement said it was working with the WHO to prepare for the virus. The drug should be taken within 48 hours of experiencing symptoms, according to the drug's Web site. Mexico has the most confirmed swine flu cases, with 397 infected people and 16 deaths, the WHO said. Mexican Health Minister Jose Angel Cordova Villalobos reported that the country has confirmed 421 cases and 19 deaths. The United States has the second-highest number of confirmed cases, with 161 sickened and one death, according to the Centers for Disease Control and Prevention and the WHO. Hundreds of guests and staff were under quarantine in China on Saturday after health officials determined that a hotel guest had contracted the H1N1 virus. She said one-third of the U.S. cases were linked to exposure in Mexico; the others were infected in their own communities. New York has the highest number of confirmed cases, with 50. Texas has 28 and California has 24. The other states include: South Carolina with 13; Massachusetts with eight; New Jersey with seven; Arizona and Delaware with four each; Illinois and Indiana with three each; Colorado, Florida, Kansas, Michigan and Virginia with two each; and Connecticut, Kentucky, Missouri, Minnesota, Nevada, Ohio and Rhode Island each have one. New York's health department on Saturday confirmed another dozen cases, bringing its total to 62 -- though the additional cases were not reflected in the CDC's tally. Connecticut also announced an additional confirmed case, while Iowa and New Mexico and reported their first cases -- though neither were immediately included in the CDC total.